Black Moss Barn offers extensive flexible family living accommodation with adjoining annexe and is situated in three acres of private grounds in a stunning location offering panoramic views including Pendle Hill and Black Moss Reservoir. Whilst enjoying a rural location with countryside walks, the property is only a short distance to nearby villages and towns and just 10 minutes’ drive to the M65 for those requiring motorway links to the business conurbations of the North West. This private and secluded property has surrounding gardens with shrubbery and flower beds, patio areas, double garage, private parking for several vehicles, an outbuilding and paddock. The property is constructed of local stone under a grey stone slate roof. All windows are hardwood and double glazed with the exception of the Velux roof lights. Black Moss Barn offers flexible living accommodation from those that require easily accessible ground floor bedrooms or the need of additional reception rooms. The property offers large reception rooms and modern day open plan living areas. The adjoining annexe is ideal for business use, hobby rooms or for dependent relatives. Stone arch porch with triple panel mahogany double glazed front door unit with Victorian lamp over. Central staircase with store cupboard underneath. Ash flooring and Parana pine skirtings and staircase leading to gallery. Fitted clothes cupboard with WC, vanity sink unit. Solid oak kitchen units with complimentary black granite worktops and tiled surround. Four oven oil-fired Aga cooker, calor gas five ring hob with calor gas double oven under. Sink with double drainer and separate reverse osmosis filtered water tap. Varnished ash tongue and groove flooring. TV & phone socket. Short stone flagged hallway to utility, double garage and annex. A range of units and worktops, Belfast sink, plumbed for two washing machines, space for dryer, two central heating boilers. Constructed on a steel frame this room has magnificent views towards Pendle Hill. Glazed atrium and Clearview 15000 BTU wood burning stove. Ornamental trough. Elm tongue and groove flooring. Triple aluminium folding doors and hardwood French windows opening onto the BBQ and patio areas. Satellite TV & phone sockets. Leading to rear door out to garden shed and oil tanks. Three single and a triple mullion window. Large stone built fireplace with wood burning stove. Pine skirtings, ash tongue & groove flooring. Views toward the reservoir and Pendle Hill. TV & phone socket. Two single, one double and triple mullion windows. Feature stone fireplace with wood burning stove and wood store to either side. Varnished ash tongue & groove flooring with Parana pine skirting and woodwork. TV & phone sockets, 3 amp lighting. Opening French windows. Currently used as a gymnasium, this room was intended as a granny flat having incorporated a hot and cold supply and a capped off main drain under the floor. It could work well using the snug as a bedroom/living arrangement. Two single and one double mullion window. Ash flooring & Parana pine skirtings with a feature exposed stone wall. Double mullion window. Single radiator, ash flooring and Parana pine skirtings. TV & phone sockets, 3 amp lighting. Ash flooring, pine Parana skirtings leading to all first floor rooms including walk-in store cupboard with loft access over the drawing and dining rooms. Fitted Parana pine bookshelves. Originally planned as two rooms, the master bedroom is large bedroom with a stepped sleeping area at one end and a comfortable seated area at the other. Fitted cupboards and hidden cupboard and drawers. Two velux windows at either end, two double mullion windows overlooking the driveway. TV & phone sockets. Loft access. Three piece en-suite with shower, vanity uniting with sink and wc, fitted cupboards. Double mullion window, TV & phone sockets, velux window. Three piece en-suite shower room. Single mullion type window, Airing cupboard housing Aga hot water cylinder. TV & phone socket. Fitted cupboards in Elm wood on two walls offering large drawers and short wardrobes on one wall and large wardrobes and a dressing table on the other. TV & phone sockets. The en-suite has a full height elm cupboard housing the bathroom hot water cylinder with storage under. Shaver socket. Mahogany panelled four piece suite Jacuzzi bath, low level wc, pedestal hand basin and bidet. Marble surround to bath and two storage cupboards. Ash tongue & groove flooring, marble window cill. Triple mullion window overlooking the driveway. Boxed in radiator, shaver socket. Accessed via a loft ladder. Under eaves storage on either side. Single window and feature triangular windows overlooking the hallway in-between the exposed roof truss. Joined to the main house by a glazed link and separate front door with access to the orangery, flagged floor with door into double garage. Currently used for business and consists of a ground floor library and cloakroom along with double garage. A staircase leads to two first floor rooms. One is a large room suitable for a snooker table and the other is currently used as an artists studio which is above the garage looking out onto open fields. 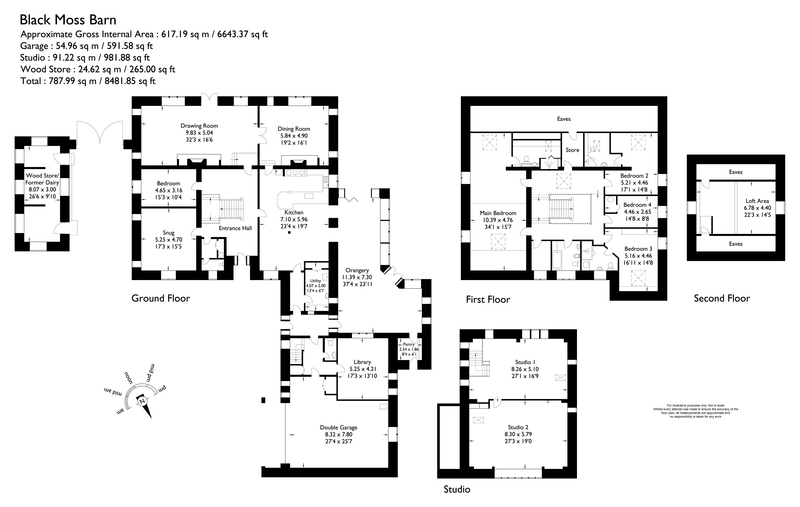 The layout would offer a large open plan living with a bedroom and bathroom for a dependent relative, however the options are endless. Cinema and projection room but could be used as a ground floor bedroom. TV and phone socket. Currently used a music room, but could be used as a games room as it would comfortably house a full sized snooker table. TV & phone socket. Large north facing artist’s studio overlooking the garden and beyond. Numerous electrical sockets, floor sockets, Belfast sink. TV & phone sockets. Used largely as a store and workshop which can easily house two cars in addition to storage. Up and over remote electrically operated double doors. Cupboard housing filtration system for the borehole water supply. Separate boiler for garage block and orangery. Approached via a tarmac driveway the house is secluded from the road by mature trees. To the top left of the driveway is a stone built former dairy with a separate water and electrical supply. Currently used a garden and wood store. At the rear of the property is a wooden potting shed and two oil tanks. The property sits in just over three acres of land, split into one area of mixed broadleaf trees, one area of rough pasture and one acre of lawn with flower beds and mature shrubs. 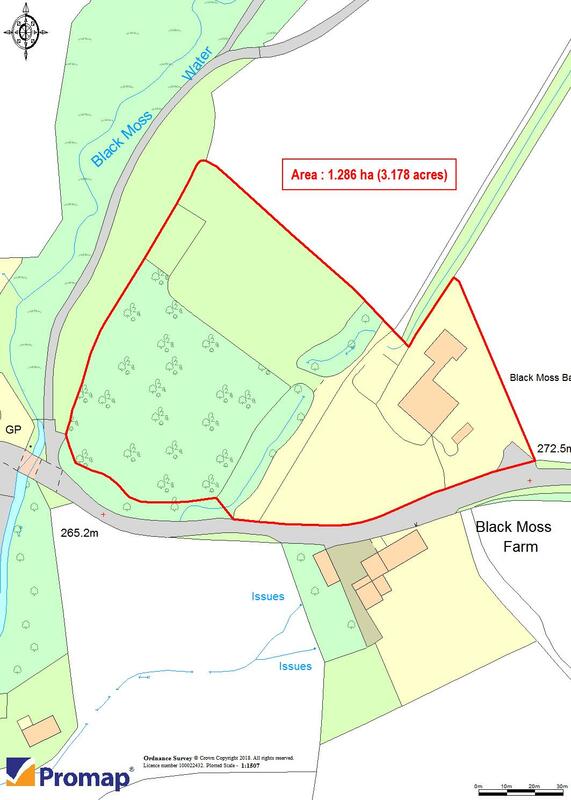 The site is bisected by a moorland stream running through a beautiful wooded gully under an earth bridge allowing access to the field and woodland. Easy access to public footpaths. Mains electricity, oil fired central heating, filtered borehole water supply, entec biodisc sewage system, two telephone lines, private mast supplying internet with speeds up to 30mb.